I’ve been a big Luke Bracey fan since I saw him in The November Man, holding his own against Pierce Brosnan. I loved him so much in Point Break that I called him Luke Break because he’s Luke Bracey from Point Break. When we spoke for Point Break, he told me about Hacksaw Ridge. Hacksaw Ridge is the true story of Desmond Doss, a conscientious objector in WWII who joined the Army to be a medic but not carry a gun. Bracey plays Smitty, recruit in Doss’s squad who at first opposes his position, in the film directed by Mel Gibson. 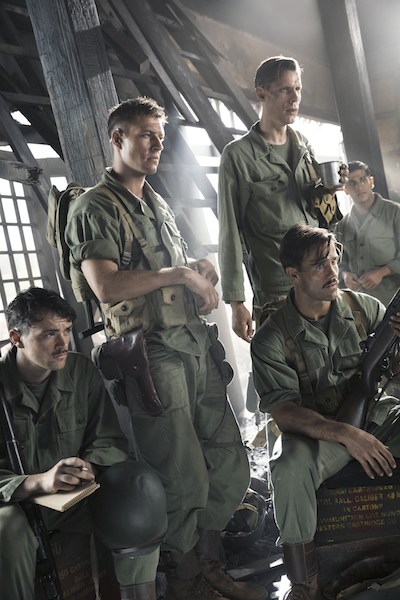 I got to speak with Luke Bracey about Hacksaw Ridge at the film’s Los Angeles press junket. 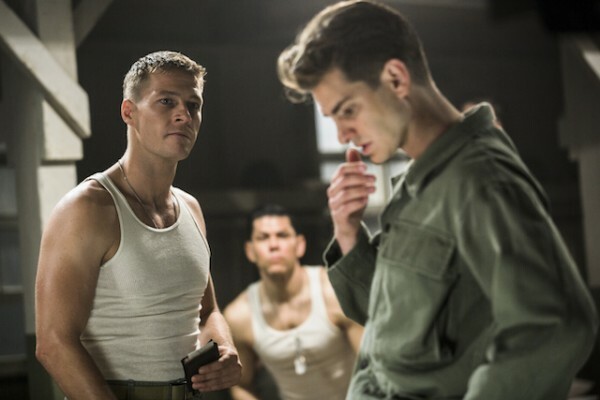 Hacksaw Ridge opens Friday. Was Smitty a real soldier in the troop Desmond was in? Luke Bracey: He’s a bit of an amalgamation of a few actually. There’s a couple of things that he does in the battles that were citations for Medal of Honor recipients. Also he gets to embody the journey of the people around him. He gets to be everything he was up against in basic training and the doubts that he was faced with, and then he gets to come around and be what everyone else came around to. He’s the amalgamation of everyone he was up against in the Army that way. Is it true of the psychology of bullies that if they call you a coward, there’s probably a good chance they feel like a coward and they’re projecting? Luke Bracey: That’s the thing. He’s a lonely and scared man. He’d gone through a lot in his life even before the war and he got this chance to go okay, this is my chance to do something with my life. I’ve been given an opportunity here to become someone, to be someone, to do something. But that still doesn’t hide the loneliness that he’s had throughout his whole life. It maybe even exemplified it. He got into this very faceless kind of machine that is the Army. All right, put your head down and get on with it, and that kind of fear is essential in all men really. I think Smitty is that epitome of the man’s mask that we put on, where we’re actually terrified but that makes us pretend to be harder than we ever are. Smitty was an amalgam, but was there a person named Smitty? Luke Bracey: I don’t think there was one man named Smitty. I think that name just kind of rings true for a Brooklyn dock worker. Was it a very Australian set with Mel directing, with Sam Worthington there? Even though you didn’t have scenes with Hugo Weaving, it seemed like all the great Australian actors were in there. Luke Bracey: Yeah, we lucked out. Teresa as well, she does such an amazing job in this. That’s the bit that kind of gets me in the movie actually is their love story. I think it’s so beautiful and so pure. I guess Andrew and Vince were basically the only non-Australians. The whole crew was Australian. I think all the post-production and everything was done down there and also the visual effects and all that stuff. It just shows the quality of work we have down there, not just coming out of actors and directors, but the whole system. The whole industry down there is so strong. They’ve made some amazing movies. The Matrix was made down there back in the 2000s. It’s a fantastic history of storytelling and moviemaking down there. I’m from Sydney so we got to film in and around Sydney. That just was kind of the icing on the cake really. I got to go to my sister’s for a barbecue on Sundays and then come to work and really enjoy being around people that I feel comfortable with and became really good mates with actually. Are any of your costars great Australian actors that we should know more about in the States? Luke Bracey: Yeah, the guy who plays Lt. Manville, his name is Ryan Corr, he’s a really good actor. Firass Dirani plays Vito Rinnelli, he’s an amazing actor. A lot of the boys in there. Ben Mingay is a tremendous entertainer as well who plays Grease. There’s a huge group of boys down there that were kind of the cream of the crop of Australian actors. You don’t know them up here but their commitment to everything just shows through the whole movie. You all have different dialects. Were you messing with each other trying to screw up each other’s voices? Luke Bracey: No, I think we were all just trying to get it right, really. It was a fun set that way but also the commitment on this movie, and that starts with Mel at the top but all the way down to the production designers, the guys flicking paint on the set. The commitment there was unrivaled. We had a lot of fun but once the cameras were on, it was work time. To be entrusted with a story like this, once the cameras were on, we wanted to make sure we were doing the right job. We had a bit of fun when the cameras were off and there were breaks between sets but also we all just wanted to do the best job we could really. Was the Brooklyn dialect a challenge for you? Luke Bracey: Look, I actually connect a bit to the east coast dialect, from Boston on down towards New York, quite easily in a way. There’s a toughness to it that is fairly similar to the Australian accent I believe in terms of the buttons you put on the end of things. I enjoy it. It becomes a very physical accent actually and it helped me in terms of my presence I thought. I really thoroughly enjoyed it. I did a lot of work. I did a lot of work on it. I went to Brooklyn and lived there for a week or two and just walked around with a Brooklyn accent listening to people. I did a lot of work with Liz Himelstein, my dialect coach who Andrew worked with, who Teresa works with as well funnily enough. I thoroughly enjoy that part of it actually and I really enjoyed the toughness that it brought to the character. Did you use her for Point Break also? Luke Bracey: Yeah, I did work with her. I’ve worked with her a couple of times actually. She’s amazing. If I’ve got an accent to do, I go to Liz. Can you tell I’m originally from the east coast? Luke Bracey: A little bit, yeah. We all geek out over Braveheart, Apocalypto and The Passion of the Christ but how does Mel actually direct? Luke Bracey: It’s funny because he’s got such an infectious kind of energy to himself when he works. He has so much fun and you can also see things going over in his mind. If you go out on something and he likes it, you can see that “oh yes.” You can see it just ticking over in his mind. When he comes around on the other end, you can see him cutting a movie together in his head. He’s got a great idea of what he wants and he’s very well planned, but he’s also so open to new things that you bring in that he comes up with. It just happens spontaneously out of the blue. And also he’s fun. He’s a fun person to direct. There’s an intensity to what we’re doing and an intensity to what we do, but sometimes between takes he’ll just come up and tell you a joke. And then go, “Do it again.” It is infectious, his energy and his love for making a story. You can’t help but just be brought in completely by that. I really enjoy the trust that he gave us. Obviously it’s a little intimidating when Mel Gibson gives you a job and you’ve got to go and try and act in front of the bloke, but he trusts you. He goes, “I got you for a reason, mate. I wanted you. You do your thing.” He herds you a little bit like a sheepdog in a way, just pushing you in this right direction. “You might fall off but just come back here.” That kind of trust, when it’s a little intimidating getting to set with Mel and then he can tell you stuff like, “Go be Steve McQueen.” Like, he thinks I can be Steve McQueen? Maybe I can. He gives you that confidence in yourself rather than that intimidation. It’s really wonderful. If I could work with him for the rest of my life, I’d sign on the dotted line right now. He used to have a reputation for being a prankster. I’m guessing not when he’s directing the movie? Luke Bracey: Yeah, it was more the jokes that were running around. He was a bit busy and this was a really quick shoot with not a lot of money. I think if we had a bit more time and a bit more money, we would have seen a few more pranks. Definitely on set he’d find something funny to do and as I said, just jokes and laughter. He’d come up to you with a plate of falafels at lunch and go, “How do you feel? I falafel.” Stuff like that. You know he just thought of it when he picked it up. Luke Bracey: Yeah, he’s a punny dude. Just everything. As I said, he’s got that real childlike exuberance. And of course he’s unflinching when it comes to the wartime violence. Was a lot of that on set or mostly added in later? Luke Bracey: No, it was a lot on set. A lot on set. I saw a cut five or six months ago. They’re like, “We’ve only put in five or 10% of the visual effects.” Then I saw it now and I can’t even really tell what they put in. A guy getting blown up and on fire hurtling towards the camera, the reason it looks real is because it’s real. A lot of it, most of it, the absolute majority of it was in camera. The special effects guys down in Australia have these new explosives, these box bombs, cardboard boxes with some stuff in it. The stuntman can stand right on top of it really and it would, as Mel says, burn your nose hair a bit. To have them around, it really added to it. 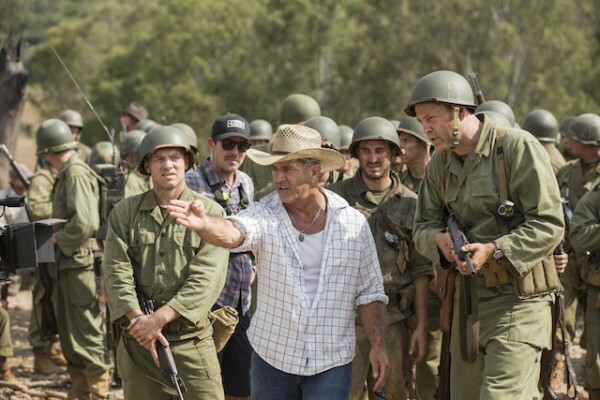 We really did a lot of it in camera and those battle scenes were really planned out by Mel and Mic Rodgers, his second unit director and stunt coordinator, they really have an idea of what they wanted to do and were lucky enough to have the apparatus down in Australia. This is the first time this stuff has been used as well, so it really helped. When you use a human torso as a shield, was that sobering? What are we going to see you in next? Luke Bracey: I’m not sure. I’m waiting for this movie to come out. I’ve taken this time to relax this year a bit and get a bit of my life back. I’ve been kind of flat out for the past three years so I spent some time just living and a little bit of a holiday over the summer but it’s hard to know exactly what you’re going to do after you make a movie like this, especially in the position I’m in.